More IGFA world-record fish were caught in 2014 on Rapala lures than any other brand of baits. 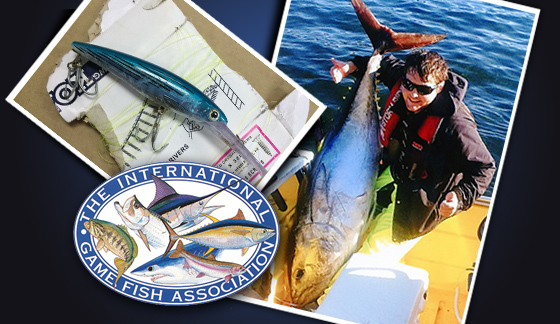 Among the 19 International Game Fish Association world-record fish caught on Rapala baits last year was a 231-pound, 13-ounce southern bluefin tuna. It came as no surprise to IGFA Chief Operating Officer Mike Myatt to see Rapala baits setting records once again. Rapala is the first and only lure manufacturer to receive an IGFA Lifetime Achievement Award. Anglers have caught world-record catches with Rapala lures on every continent but one. Also in 2014, Rapala scales determined the weight of 61 IGFA world-record catches. But you don’t have to be record-setter to enjoy setting the hook with a Rapala tied on. Anglers across the globe catch more fish, make more memories and put more fillets on the table with Rapala baits. Storm baits yielded two IGFA world-record catches, including a 32-pound, 13-ounce African red snapper. Williamson and Blue Fox lures each accounted for a world-record catch apiece, a 69-pound, 1-ounce southern bluefin tuna and a 90-centimeter (about 35 1/2 inches) arctic char. Storm, Williamson and Blue Fox are among the many respected names in the Rapala family of brands. So too is Sufix fishing line, which accounted for almost two dozen world-record catches in 2014. Across the globe, anglers caught 23 IGFA world-record fish on Sufix line in 2014, including a 215-pound, 8-oz. Atlantic bigeye tuna, a 136-pound, 10-ounce Atlantic Sailfish, a 59-pound, 8-ounce Pacific black snook, a 47-pound, 6-ounce white marlin and a 44-pound alligator gar. This entry was posted in Blue Fox, News, Rapala, Storm, Sufix, Williamson and tagged Blue Fox, Rapala, Storm, Sufix, Williamson. Bookmark the permalink.